Ransomware virus is trending this week as a lot of systems have been hit by the attacks that followed previous week. Hence, we have tried to formulate a complete detail of this virus and its effects on the attacked systems. Ransomware is a king of Malware that have already spread across 150+ countries. This virus is based on WannaCry Decryptor that surfaced some year ago. 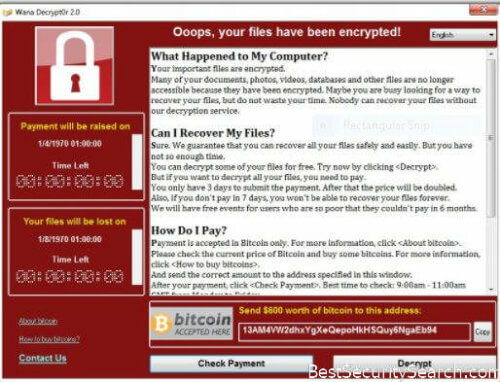 WannaCry decryptor usually encrypts some part of the file and then demands a ransom to be paid. How Does Ransomware Virus Work? A Trojanhourse is delivered via email or some messaging portal or an advertisement to any bank staff. Trojan is equipped with a hyperlink which is accidently clicked and activated. The staff might have not clicked the exact link, but might have opened the email (in the current case). Once activated,the ransomware spreads across the computer. It now starts encrypting important files with a key that is only known to the attackers. After the encryption process, all the original files are deleted and a ransom note is delivered to the Bank. This note can be in the form of text or an image. The attackers can now demand a ransom of any amount. Once the ransom is paid, the attackers will release the decrypting key of encrypted files. In current case , attackers demanded $300 with every attacked system to be paid in the form of Bitcoin. Currently no organizations are paying any kind of ransom to the attackers. As said by an expert, the ransomware that attacked the systems was based on weak algorithm that was easily detected by antivirus programs such as Nortan and Kasperkey. In this case, the ransomware virus failed to start any real trouble. But this might be just a beginning. It is now clear that a network of 150 countries can easily be attacked with such kind of malware. Hence, the attackers can come with a more powerful virus that can cause real troubles. It might be time that we all start paying for premium antivirus software for our systems.